First Thought After Finishing: Tahereh Mafi has such a way with words. And characters. And did I mention words? From the very first page of this trilogy, I have been hooked on the story. I can still remember all of the hype over the first book, and it was definitely there for a reason. After such a powerful second book, it would have been easy for this third book to fall flat, but it doesn’t. 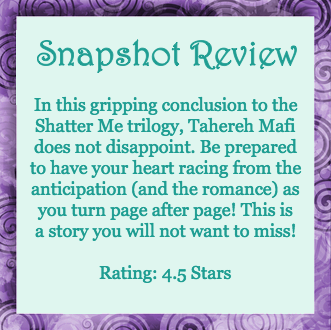 Instead, Tahereh Mafi surpasses herself and delivers an epic conclusion. 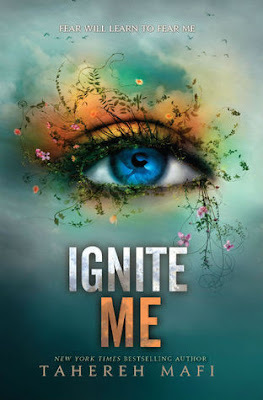 Ignite Me starts just after the terrifying events of Unravel Me. Juliette may have been disoriented and believed her group to be defeated, but with the help of Warner, she soon discovers just how much work is left to be done and just how far she will have to push herself. With the help of a few favorite people, Juliette grows (by leaps and bounds) to become the heroine she never imagined she could be. Holy action and character development, Batman! This book has no shortage of either. Juliette, Warner, and Adam are put to test after test in this book—emotionally moreso than physically. I admired the way Juliette came to embrace her true nature and assert herself in the role she deserved. And Warner…are there even enough words to describe Warner? “Book boyfriend” and “More, please!” come to mind. I loved him in the last book (Chapter 62, anyone?) and I love him even more here. That probably makes it no surprise that I am not a huge fan of Adam. Honestly, I wanted to reach into the pages and smack sense into him. His petulance and reticence to recognize something bigger than himself annoyed me. Fortunately, everyone else in the book made up for Adam’s defects. Kenji was as amusing as ever. He’s still the kind of guy BFF that every girl wants to have, and I would have loved to see him on the page more. And amidst all of the action—there are major battle preparations underway here—sparks are definitely flying. It’s no surprise why this book is called Ignite Me—the chemistry sizzles off the page and fuels the book. Throughout this trilogy, the development of plot and characters, the tension and urgency, and the need to read “just one more page” (even in the wee hours of the morning…the night before a meeting…) never abate. It’s a testament to the characters and the author when love for a story can stay strong across years and even after the story’s conclusion, and that is exactly what happened here. Tahereh will also have more books in this world coming in the future, and I absolutely can’t wait to read more from her!